Pastry & Dessert Techniques presents 35 proven pastry techniques that can be used by novice cooks, culinary students, apprentices, and seasoned veterans of the professional kitchen to create both sweet and savory pastries as well as desserts. Large, step-by-step photos showcase the execution of foundational techniques being used to create 65 elegant pastries and desserts. Some of the recipes contain variations or subcomponent recipes. Online Learner Resources are included with this book. 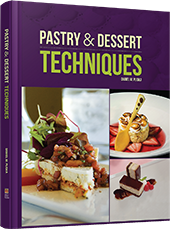 Part I: Foundational Pastry Techniques explains foundational pastry techniques and the technique recipes that help build the skills needed to make sweet and savory pastries and desserts. Part II: Savory Pastry Basics explains the pastry techniques often used in savory applications. Part III: Plate Presentation showcases the importance of using artistic techniques to elevate the visual appeal of pastries and desserts on the plate and on displays. Part IV: Classics and Signatures showcases classic pastries and desserts that have stood the test of time and how to use foundational techniques and recipes to create spectacular signature pastries and desserts.